Madeline Gannon’s Reverberating Across the Divide project reconnects digital and physical contexts through a custom chronomorphologic modeling environment. 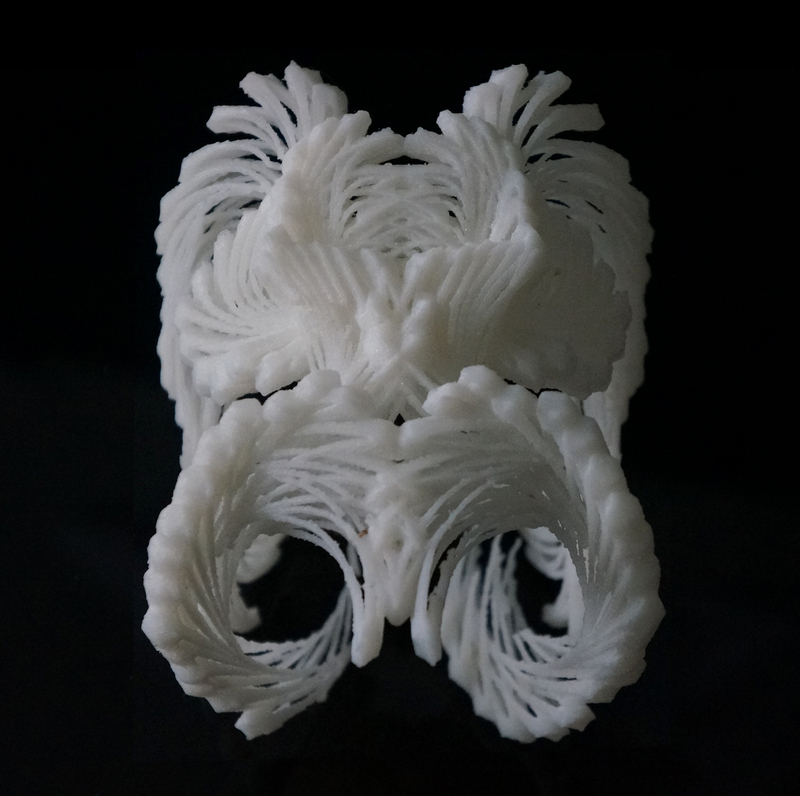 The modeling interface uses a three phase workflow (3D scanning, 3D modeling, and 3D printing) to enable a designer to craft intricate digital geometries around pre-existing physical contexts. There is still a palpable disconnect between how one designs in the digital realm, and how one realizes a design in the physical realm. A number of factors contribute to this gap, including a virtual environment’s infinite scale, its autonomy from a tangible context, and its lack of physical materiality. Reverberating Across the Divide addresses such issues through a custom vision-based, “chronomorphological” modeling software that uses a 3D scanning/sensing/printing workflow to merge digital processes in design with physical processes in fabrication. Chronomorphology –– like its nineteenth-century counterpart chronophotography –– is a composite recording of an object’s movement. Instead of a photograph, however, the recording medium here is a full three-dimensional model of the object — a virtual creature simulated within a digital environment. 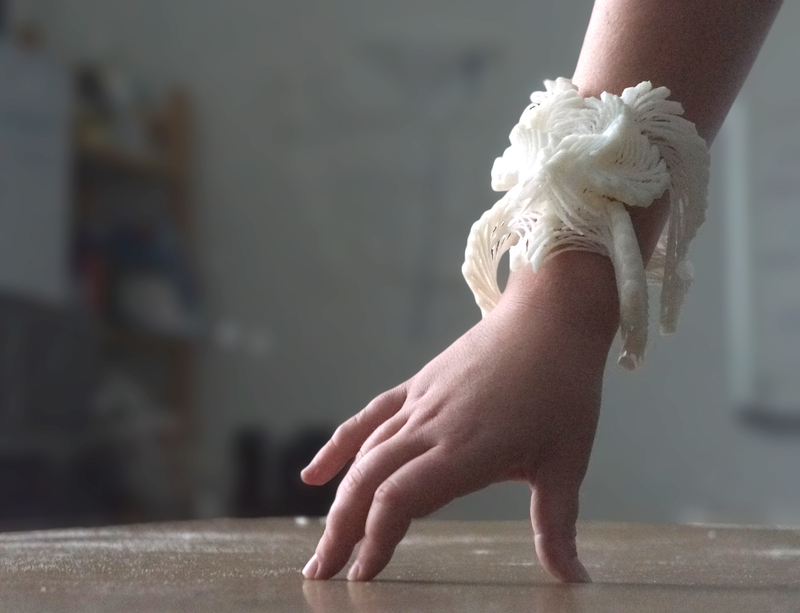 This virtual creature exists as a 3D printable module; it is constructed as a closed mesh, with a spring skeleton that prevents self-intersections. The composite, chronomorphologic model (of the virtual creature over time) retains these printable properties at each time-step. Therefore, no matter how intricate or complex, the digital geometry will always be exported as a valid, 3D printable mesh. The chronomorphologic modeling environment facilitates the rapid generation of baroque and expressive spatial forms that both respond and expand on existing physical contexts. 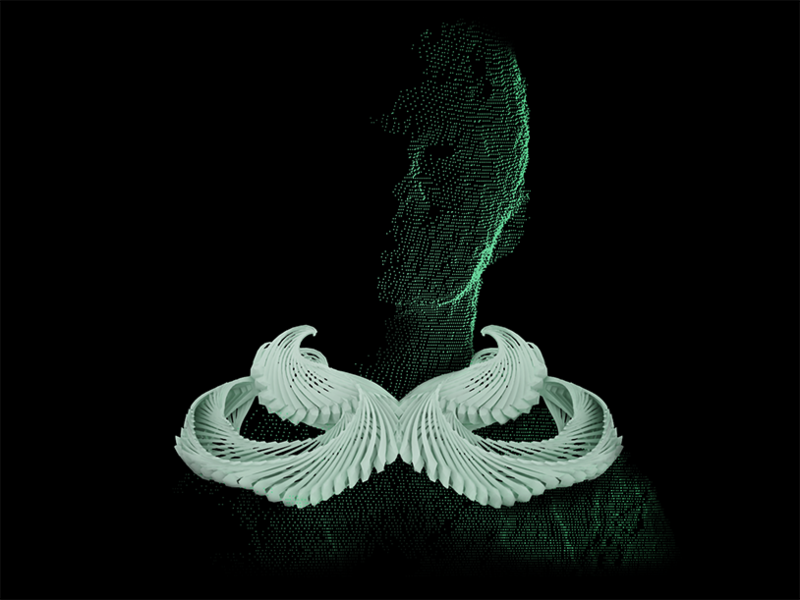 By mediating 3D scanning and 3D printing through the modeling environment, the designer has a streamlined workflow for oscillating between virtual and analog environments. This ease between digital design and physical production provides a framework for rapidly exploring how subtle changes in the virtual environment, physical environment, or designer’s gestures can create dynamic variation in the formal, material, and spatial qualities of a generated design. Reverberating Across the Divide was supported by a grant from the Frank-Ratchye Fund for Art @ the Frontier (FRFAF)— an endowment founded to encourage the creation of innovative artworks by the faculty, students and staff of Carnegie Mellon University. With this fund, the STUDIO seeks to develop a cache of groundbreaking projects created at CMU — works that can be described as “thinking at the edges” of the intersection of disciplines. Madeline Gannon is a doctoral student studying generative fabrication and computational design in the CMU School of Architecture.